It is rare, if not unprecedented, to find a book written by an accomplished winemaker that exposes the inner and often secretive workings of well-known wineries through first hand experience. It is a challenge to find a winemaker like Peterson who talks honestly and frankly about his or her colleagues and can speak from a position of expertise about the reasons for their success or failure. What makes this book so captivating and insightful is that Peterson carefully documented his years in the wine business through compulsive detailed written documentation and audio tapes. As much a biography as an exposé, this story offers a personal divulgement that is extremely rare in today’s wine business. The author, Dr. Richard Peterson, has had a rich career in the California wine industry as a winemaker, educator, wine judge, viticulture and enology consultant and expert witness in legal cases. Born in the midst of the Depression in Iowa to a coal miner father and home-based mother, Peterson showed an early interest in science and gained an undergraduate education through an NROTC program, served in the marine corp, and gained an MS in Food Science and a PhD in Agricultural Chemistry from the University of California at Berkeley under the GI bill. His career in the wine industry began in 1958 when he was hired at E. & J. Gallo. Years later, he went on to replace the legendary Andre Tchelistcheff as the winemaker at Beaulieu Vineyards, with Tchelistcheff becoming a long time mentor and friend. Peterson eventually became Winemaster and President of the ill-fated The Monterey Vineyard, and partnered in the Atlas Peak wine project as well. He was responsible for creating many new wines along the way at Gallo, as well as Seagram’s first wine cooler, Lancers Vinho Branco in Portugal and all the original Taylor California Cellars wines. Among his innovations, he invented the Peterson steel barrel pallet used by most wineries in America today. The book reveals startling revelations about the lack of equipment and sanitation at Beaulieu Vineyards, a winery owned by aristocrats who never stepped foot in the winery and eventually strangled the winery. The Monterey Vineyard was a magnificent opportunity yet corporate misdirection and infighting led to eventually bankruptcy. Peterson would note, “They began by fighting their competitors, then chasing them, until both contestants only copied and recopied each other; in the end, most never knew why they had failed.” Peterson speaks candidly to the lack of basic competence among many winemakers, “Producing wines that are embarrassments to their peers.” These are but snippets of this engaging tale that will captivate all wine lovers. 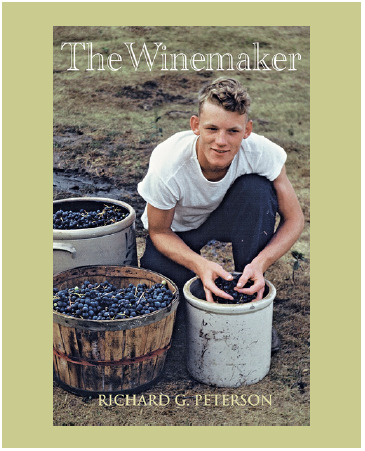 The Winemaker, Richard G. Peterson, Meadowlark Publishing, 2015, hard cover, 400 pages, $29.95.